The Pangere Corporation was selected by ArcelorMittal to construct the new 504 Boiler Building. The overall project, which was designed to transfer blast furnace gas from a flare at no. 7 blast furnace to a new boiler capable of generating steam and electricity, included self-perform work from various disciplines performed by Pangere. 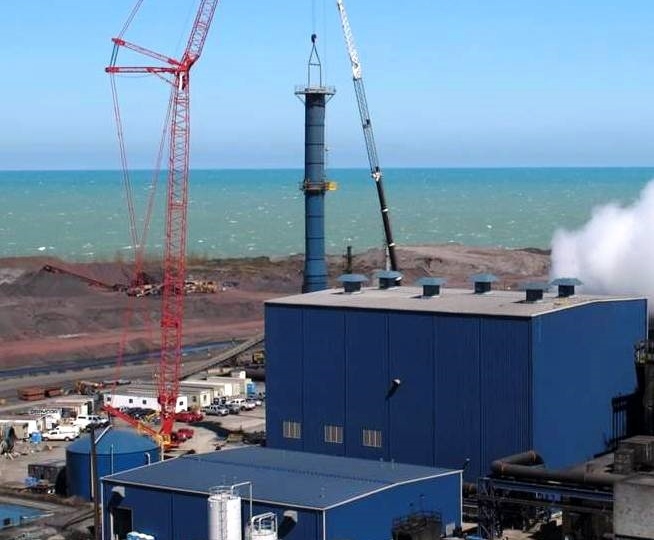 The Pangere Corporation was responsible for the structural design of the 100' tall building which included an overhead crane, removable columns to allow for the boiler installation, tank and maintenance platforms, and a transitional connection to the existing No. 5 boilerhouse. Work performed directly by Pangere included steel erection, sheeting, painting, overhead door installation, and work from Pangere's Laborers division. The project required an immense amount of co-ordination with various crafts and contractors as the time sensitive schedule called for the erection of the building to coincide with the projects boiler and piping installation. In addition, Pangere oversaw electrical work as well as the installation of the buildings HVAC system.